Symptoms of Diabetic Peripheral Neuropathy usually begin to decrease in as little as 3 days after starting the Neuro-No 2 treatment. This should be used as a first line of treatment in Diabetic Peripheral Neuropathy since it is the safest method of reducing the symptoms of Diabetic Neuropathic pain. Neuro-No 2: 50 mg is taken 2 times a day in combination of Neuro-No 2: 100 mg one time a day, and must be used in combination of a B12 intramuscular injection between 1-2 times a week. This combination must be used continuously as directed, or the symptoms will return. Neuro-No 2: 100mg. is a first line treatment made of a combination of Thiamine, Riboflavin, Niacin, Pyridoxine, Folic acid, Cyanocobalamin, Biotin and Pantothenic acid formulated to be time released throughout the day. 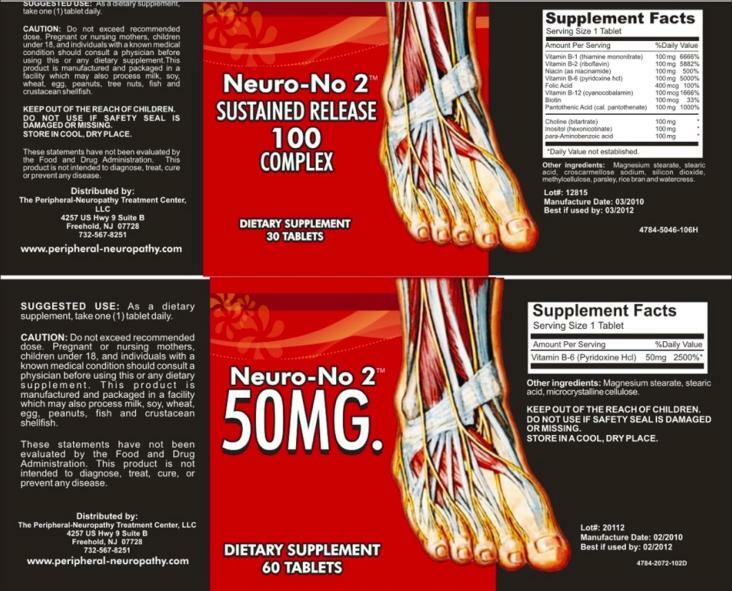 Neuro-No 2: 50 mg is used in combination with Neuro-No 2: 50 mg. It is comprised of a specific time released formula of Pyridoxine 50 mg.
Neuro-No 2 is not curing the disease but does treat the symptoms. If the above does not work sufficiently, the other medications would be used next.